A group of independent filmmakers documenting the making an independent 3D found footage horror movie find themselves in a real-life horror situation. A documentary about making a found-footage horror movie becomes a found-footage horror movie. It's sooooooo meta. Found-footage films have been around for a long time. One of the earliest examples is "Cannibal Holocaust" from way back in 1980. Some of them work really well, and some don't work at all. They are often nonsensical and loaded with cliches. Writer/director Steven DeGennaro attempts to do something a little different with the genre by making a self-aware found-footage flick in "Found Footage 3D." It is about a film crew making a low budget found-footage horror movie. They are shooting it at what the locals claim is a haunted house with a tragic history. While they shoot their movie, weird things begin to happen as the crew members become victims of an actual haunting. The movie star Carter Roy, Alena von Stroheim, Chris O'Brien, Tom Saporito, Scott Allen Perry, and Jessica Perrin, who make up the members of the cast and crew of the movie within the movie. It would seem Steven DeGennaro wants to do to the found-footage genre what Wes Craven did with "Scream" and the slasher genre: he wants to make a movie that spends much of the time pointing out the tropes and cliches of that style of filmmaking, only to fall into the tropes and cliches of the genre. By pointing out they are aware they are making a cliche-riddled movie, the hope is that it will make it perfectly acceptable to make a cliche-riddled movie. This can work...up to a point. The problem is "Found Footage 3D" spends so much time being meta that it forgets to be anything else. The vast majority of the film is insufferably boring and consists of a separated couple arguing while they are pretending to be a married couple whose relationship is falling apart for their movie. This winds up being more annoying than engaging or interesting. The film slogs along for about the first hour and thirty minutes as it builds to its final conclusion. The last ten minutes is when the audience finally gets an all-out horror bloodbath, and we will admit, this last little bit has some really satisfying gore in it. Unfortunately, these precious few minutes aren't enough to justify the molasses-slow 90 minutes leading up to it. 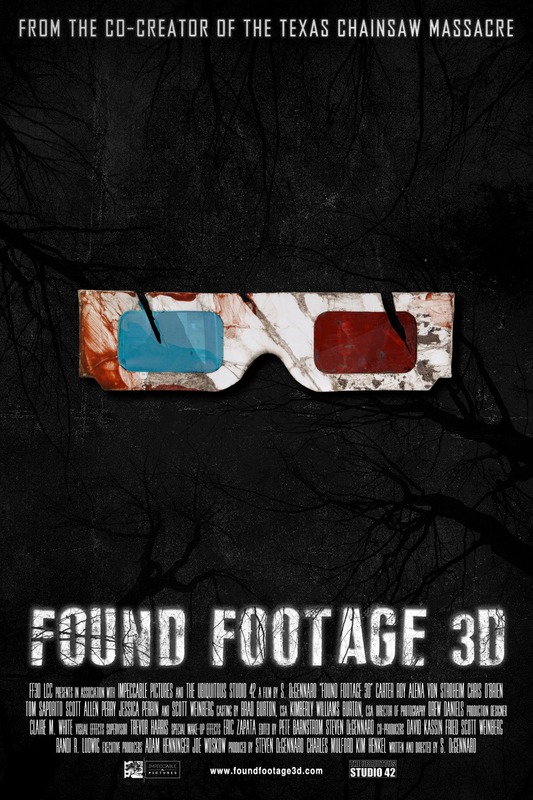 "Found Footage 3D" easily could have been 30 minutes shorter. In fact, this material may have been better suited for a short film. It fails to build the necessary tension and suspense needed to make a found-footage movie successful, and the satire just isn't good enough to make the entire thing funny on a consistent basis. In the end, the movie winds up being even less tolerable than most of the found-footage films it is making fun of for nearly its entire runtime.